The “Real” Nick Markakis …..
Over the past several seasons, I’ve watched and listened to Orioles fans as they’ve brimmed with renewed early season confidence – only to be dashed by the reality of substandard ability, by summer’s arrival. It’s become an annual ritual – and as dependable as the heat and humidity that arrive around the same time. With exception to Brian Roberts, the Orioles have endured an incredibly barren streak of 1st ROUND DRAFT BUSTS. Aside from the accusations of being “penny pinchers” and “tightwads,” I honestly believe poor draft selections have been the primary culprit in putting the team where they’re found today. Look at the roster of any franchise in baseball. There are three basic recipe’s to the contending team ….. In consideration of all three approaches, the Baltimore Orioles have failed. In saying this, I’m not disparaging Mr. Angelos, nor ridiculing his sons and other top officials. I’m just being truthful ….. and facing the reality of an era of poor planning and development. The team’s ownership and power structure is accountable to the failures. That said, I don’t think it’s productive to arbitrarily bash them. And, I do think the franchise is turning the corner in it’s quest for respectability, once again, under Andy MacPhail’s leadership. But, how much damage has been done to the fan base? And, no, I’m not talking about disgruntled, jaded former baseball lovers. Aside from the indifference created by a decade of losing, I’ve wondered if our opinions and judgements of baseball talent been skewed? Are Orioles fans hungering for that next STAR, so to speak? 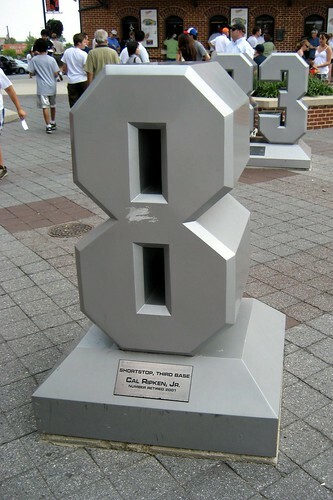 After all, it’s been quite a while since one of these have popped up on Eutaw Street …..
As I’ve said, Brian Roberts has been a stellar contributor to a downtrodden organization, over the past several seasons. He’s a steady producer – he worked his way through the system – and Orioles fans love him. 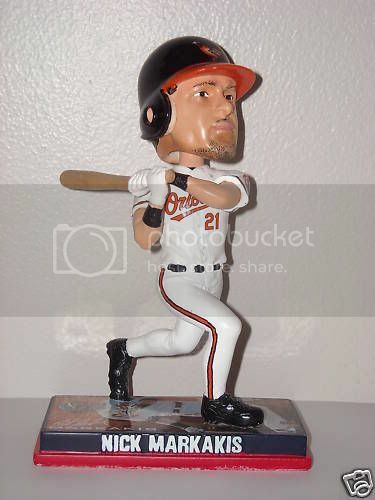 He’s been the face of the Baltimore Orioles, sorta ….. 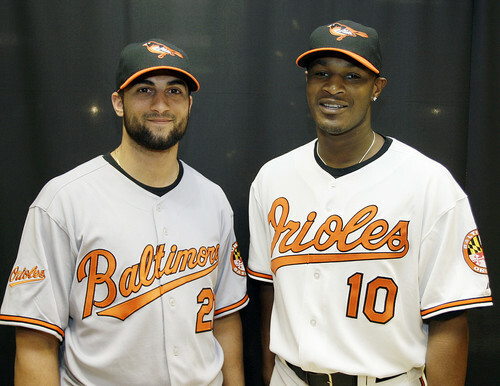 Since 2007, Roberts has shared the team’s mantel with Nick Markakis. Since his emergence in late-2006, Markakis has been a formidable, dependable presence in the Orioles lineup. He has, for the most part, improved his game and production in impressive fashion. 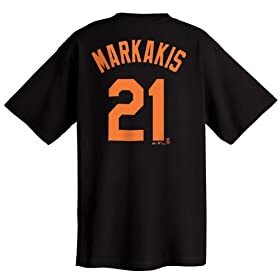 Combine a respectable power stroke with speed – put it in an Orioles uniform ….. and you’re likely to find the mild-mannered Markakis staring squarely ahead …..
He’s a good Major League Baseball Player. But, is he the player Orioles fans tout as one of their “untouchables” as we enter an era of hopeful growth and contention? An overwhelming amount of Orioles fans would likely designate Markakis that very UNTOUCHABLE PLAYER – unavailable to any prospective suitor, regardless of the package. Fair enough. But, this blog isn’t about trading or shedding Nick Markakis from the Orioles organization. He’s one of the stable cogs to come through Frederick and Bowie, since the 1990’s. If the Orioles had 4 or 5 players of Nick Markakis’ ilk come along over the last decade, the team wouldn’t be where it is today. And, he finally has some help …..
Once again, Nick Markakis is a good ballplayer. He would be a starting outfielder on any team. I’m just not certain he’s the caliber of player Orioles fans envision, as they hold out hope for an Orioles team that will win and compete in the American League’s Eastern Division. To be blunt, I view Markakis as more of a complimentary, but steady force in a prospective winning lineup. I just don’t view him as the ideal #3 or #4 hitter on a team that plays baseball deep into October. Would he bat 3rd or 4th for most of the teams that qualified for the postseason, in 2009? How about 2008? Would they be making these in Boston? Would they entice fans to attend games, in L.A., with these? Do you get my point? While I like Markakis, I simply question whether he’s really of the pedigree most Baltimoreans believe. Can he anchor a team’s lineup, while batting 3rd in the order? If I’m going to judge him on last season’s production, I’d say he’s not suited to bat in that spot. While his overall numbers were very good, his power production dipped, slightly. That could be the result of who bats behind him. However, it could also be tied to the responsibilities and expectations of the #3 hitter. Nick Markakis flourished while batting 2nd, in a very suspect lineup. He worked the count, with an excellent eye, and drove alot of deep count pitches. But, batting 3rd brings about different expectations and a more aggressive approach at the plate. 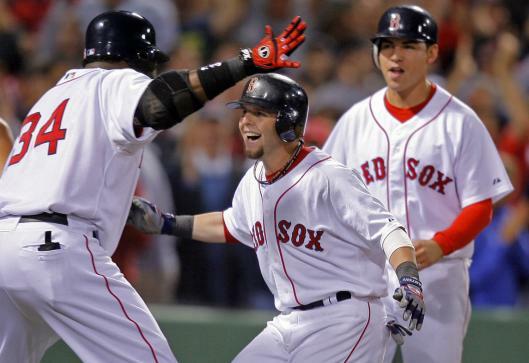 The heart of any formidable lineup is the 3, 4 and 5 hitters. Contending teams produce 25+ homeruns, per season, from these spots. Check it out. And, while some contenders occasionally miss this threshold on one respective hole, it’s made up in the other two spots. The Orioles consistently fail at producing 25+ homeruns from the heart of their lineup. And, it starts with their choice as the #3 hitter …..
I’ve been a steady proponent of moving Nick Markakis back to the 2nd spot in the lineup. That’s where he belongs …..
During today’s edition of the “Rex & Ray Show,” we’ll welcome our resident WNST baseball correspondent, Allen McCallum, for an afternoon hot stove discussion. We’re certain to touch on Nick Markakis, and his relevence in the Orioles lineup. Feel free to call with your thoughts or email opinions. It starts TODAY, at 2pm …..